﻿ 1 John 4:14 We have seen and testify that the Father has sent the Son to be the Savior of the world. And we have seen and we testify that the Father has sent the Son as Savior of the world. And we have seen and testify that the Father has sent the Son, a Savior of the world. And we have beheld and bear witness that the Father hath sent the Son to be the Saviour of the world. And we have seen, and we do testify, that the Father sent the Son to be the Savior of the. world. And we have seen and give witness that the Father sent the Son to be the Saviour of the world. 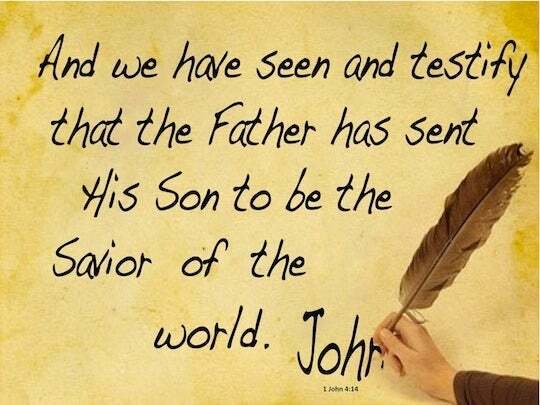 and we have seen, and do testify, that the father hath sent the son to be the saviour of the world. And we have seen, and testify, that the Father has sent the Son as Saviour of the world. 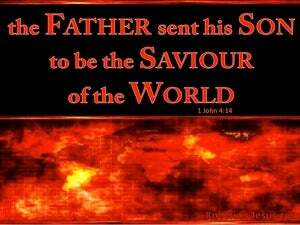 Now we have seen, and bear testimony, that the Father has sent forth his Son, to be the Saviour of the world. And we have seen and we testify that the Father has sent forth his Son the Saviour of the world. We have seen and can testify that the Father has sent the Son to be Savior of the world. And we have seen and testify that the Father has sent his. Son a Saviour of the world. And we have seen and testify that the Father has sent the Son [to be the] Savior of the world. And we have seen and testify that the Father sent the Son to be the Savior of the world. And we have seen and do testify that the father hath sent his son, which is the saviour of the world. and we have seen, we can testify, that the Father has sent the Son as the Saviour of the world. and we have beheld and do testify that the Father has sent the Son to be the Saviour of the world. And we have seen and testify that the Father has sent the Son to be the Savior of the world. And we have seen and bear witness, that the Father hath sent the Son to be the Saviour of the world. And we have seen and testify that the Father has sent the Son, the Saviour of the world. And, we, for ourselves have gazed, and are bearing witness - that, the Father, sent forth the Son, as Saviour of the world. And we have seen and bear testimony, that the Father sent the Son to be the Saviour of the world. Moreover, our eyes have seen--and we are testifying to the fact--that the Father has sent the Son to be the Savior of the world. And we have seen and do testify, that the Father sent the Son to be the Savior of the world. We have seen and now testify that the Father has sent His Son to be the Saviour of the world. And we have beheld, and testify, that the Father hath sent the Son, as Savior of the world. 13 By this we know that we abide in Him and He in us, because He has given us of His Spirit. 14 We have seen and testify that the Father has sent the Son to be the Savior of the world. 15 Whoever confesses that Jesus is the Son of God, God abides in him, and he in God.